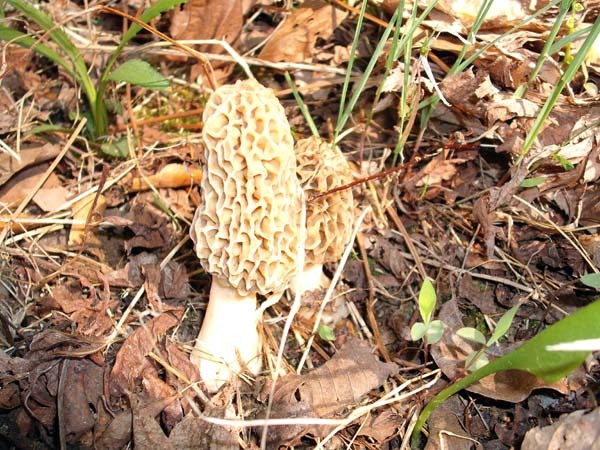 This is my favorite time of year, for many reasons, but mostly because it’s time to go morel hunting! The past 3 years since the birth of my daughter it has been really hard for me to get out there and go and more often than not, we get skunked. Finally this past Saturday we found some. Morel season doesn’t last very long. Maybe a month at best. 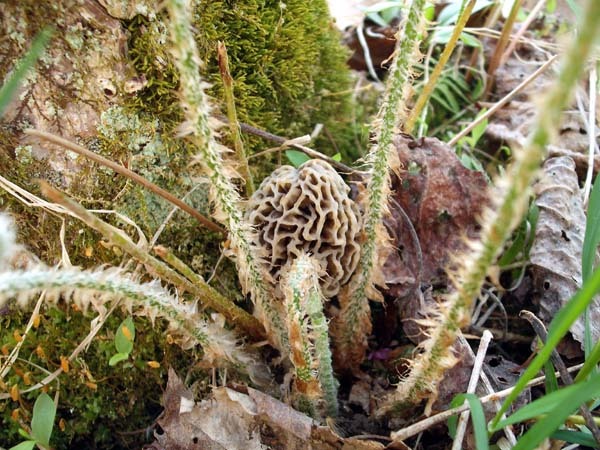 April 10th at the earliest we begin looking for the black morels (Morchella elata). We used to have a great patch for those, but it has been bulldozed and is barely recognizable anymore and no longer productive. The ones we like best though are the yellow or gray morels (M. esculenta and M. deliciosa). When you see the may apples suddenly up, it is time to look for those. There is also another variety common around here called the half-free morel, but it is thin and fragile and grows very randomly, not in large patches like the others do. The half-frees we usually find midseason between the other two. When we found these yellow morels on Saturday, they were a bit small, most with caps about 1 1/2″ tall. They are just getting started and this week will be the best time to find them. I also told my brother that it is upon pain of death that I reveal my secret morel hunting patches to him. Under no circumstances is he to tell anyone where we went or to take another human being, not even a girlfriend. The location was revealed to me under the same terms by my father-in-law, but now that he has passed, I barely have anyone who will go with me. My husband will go once or twice if he has time. He loves to eat them, but he is not as dedicated to hunting them as I am. 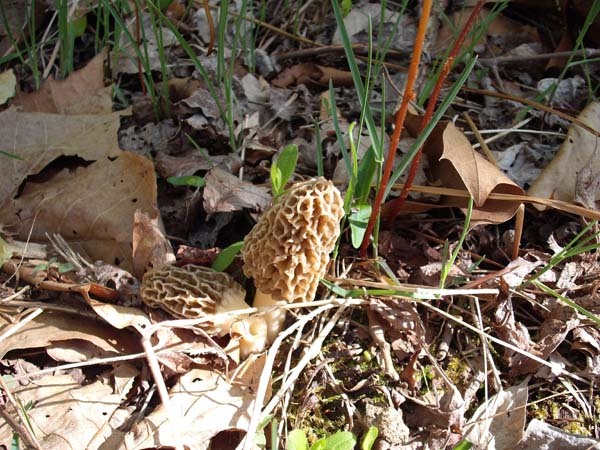 There is a true saying that goes “anyone foolish enough to ask a morel hunter where they found them is probably also foolish enough to believe the answer”. This little morel was hiding in between a fiddlehead fern and the base of a tree. I thought this was a neat shot. 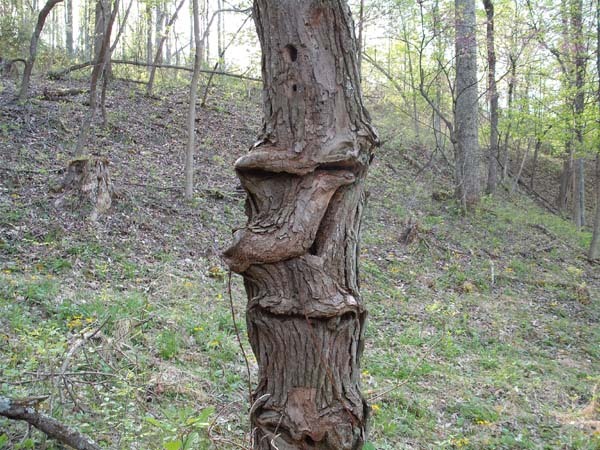 We always find neat things out in these woods. 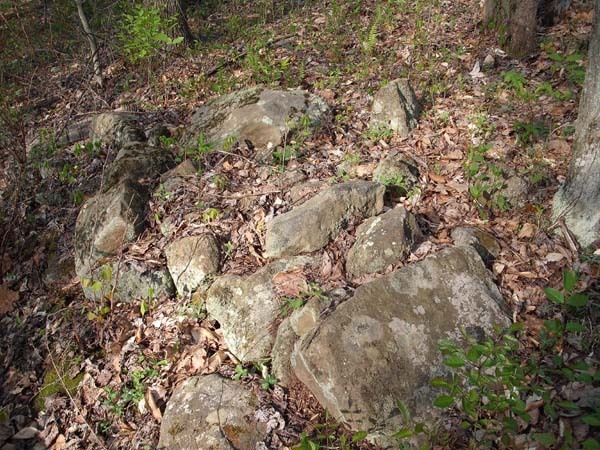 There are several old home sites with the foundations and remains of what was once a dwelling place. It’s hard to imagine someone living in these steep, nearly inaccessible woods. You can still tell where the clearings were as they remain mostly grassy even today. We’ve found old bottles, wrought iron bed frames (which my mother-in-law has used as a quaint trellis for a climbing rose), pieces of wooden and metal farm equipment and other discarded signs of human life. One particularly enchanting spot has an open well, wild apple and pawpaw trees and a thick blanket of daffodils of several old varieties which have multiplied to cover a large area. We’ve dug and taken home several starts of iris, peony and other hardy perennials. There are also piles and piles of mossy, weathered rocks everywhere you look. I would love to haul them all home for use in my flower garden and for landscaping around the house. Most were piled to the side either when fields were cleared or as logging roads pushed through. The area was logged about 20 years ago. Trees and brush come up through most of the old roads and the area is mostly inaccessible except by foot. It’s a really neat place. It feels so far away from civilization, although in truth it is maybe a 20 minute drive from my mother-in-law’s house. My father-in-law began exploring the area back in the 1980’s. When he would get off from work at the coal mines, he would come out here and hunt ginseng and morels. Most of the land is still owned by the logging company today. Very little of it is posted. I love and look forward to the yearly ritual of coming out here and hiking the hills. I plan to go back out Thursday and/or Saturday of this week. I hope to come back with a bagful of mushrooms! It’s always fun to go, even if you only find a few.